There are some accessories in a Chinese kitchen that I have no English names for. 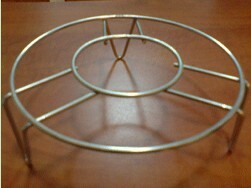 One of them is this item below used to prop up bowls or tureens during cooking. The closest I could think of is a tripod. It is a metal structure with 3 legs that you place at the bottom of the big pot or rice cooker to act as a pedestal for the soup bowl.If you do a lot of cooking with steam, a tripod is a more convenient and safer tool than a plate. Chinese grocery shops or supermarkets should stock these.If you cannot locate this little tripod, use a plate. Invert the plate and place it at the bottom of the wok or pot. Place the soup bowl on top of the plate.